The Adventures of Pinocchio is a film directed by Steve Barron and starring for Jonathan Taylor Thomas, Martin Landau and Genevieve Bujold, aimed at children in the year 1986, leading to the famous story screens, mixing inanimate characters with people. In the soundtrack, we found several songs written and performed by Stevie Wonder. 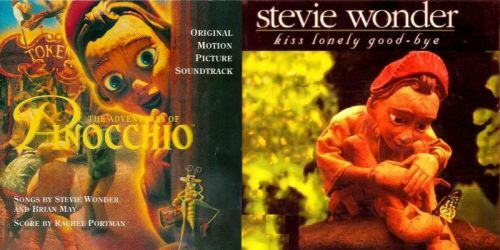 "Kiss Lonely Good-Bye" and "Hold On To Your Dreams" in different versions, and the instrumental "Pinocchio's Evolution".